The Randy Report: The Return Of Kevin Spacey: "You Wouldn't Believe The Worst Without Evidence, Would You?" The Return Of Kevin Spacey: "You Wouldn't Believe The Worst Without Evidence, Would You?" Kevin Spacey briefly returned to his House of Cards role of “Frank Underwood” in a video posted to his YouTube channel that has lots of folks scratching their heads. The actor, who was fired from the hit Netflix series amid several allegations of sexual impropriety, speaks to the camera in the same style utilized by ‘Frank’ with language that could apply both to his character’s sudden death and his own personal legal challenges. According to The Boston Globe, Spacey is scheduled to be arraigned on January 7 in Nantucket regarding a criminal complaint of indecent assault and battery that allegedly happened in July 2016. A link to the video was tweeted out by Spacey (his first tweet in a year) minutes after the Globe’s story was published. “Oh sure, they may have tried to separate us, but what we have is too strong, too powerful,” he continues. Clearly, Spacey is attempting to offer his own House of Cards finale, but there’s a wink of the eye in his choice of words and timing of the video. Interestingly, most commenters on the YouTube page are raving, saying the ‘scene’ was much better than the actual final season of House of Cards. Watch the three-minute video below and let me know what you think in the comments section. 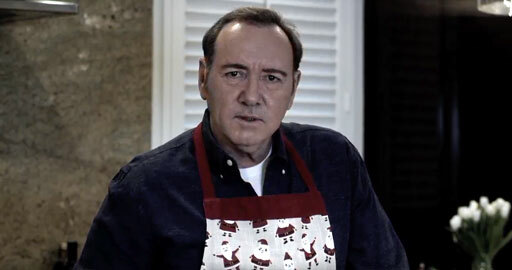 PR flack: "So here's our idea: we film you, in character as Frank Underwood, in a poorly-lit kitchen, reciting a ton of skin-crawling dialogue, and then we release the clip on Christmas Eve."